Congratulations to the prolific Cory Doctorow who fittingly, on Friday last, 8 June 2012, was awarded an honorary doctorate by the Open University. Professor Marian Petre made the presentation explaining why Cory had been honoured. "Cory Doctorow is a science fiction novelist, blogger and civil rights activist. He is the co-editor of the hugely popular weblog Boing Boing (boingboing.net), and is a regular columnist for The Guardian, Wired, Popular Science, Make, The New York Times, and many other newspapers, magazines and websites. He was formerly Director of European Affairs for the Electronic Frontier Foundation (eff.org) and was a founder of the UK-based Open Rights Group, both non-profit civil liberties organizations that defend freedom in technology law, policy, standards and treaties. He has worked at the UN, with standards bodies, governments, industry, universities and other non-profit organizations promoting a balanced approach to intellectual property law, a policy area of special educational concern to the Open University. In 2007, he served as the Fulbright Chair at the Annenberg Center for Public Diplomacy at the University of Southern California. His internationally-renowned science fiction novels are simultaneously published by Tor Books and released on the Internet under Creative Commons licenses that encourage their re-use and sharing, a demonstration of his philosophy on open publication. He has won the Locus and Sunburst Awards, and been nominated for the Hugo, Nebula and British Science Fiction Awards. Entertainment Weekly has called Doctorow "The William Gibson of his generation." At a time when technological developments and associated regulations are transforming our society, including our concepts of privacy and freedom of expression, Doctorow has been a tireless campaigner for the free flow of ideas, educating the press, policymakers, OU students and the general public alike about civil liberties issues related to technology and intellectual property law. In IP law in recent years, far removed from the attention of most ordinary people, there has been a dramatic expansion in government-granted monopolies over broad swathes of knowledge – patents on human genes or ways of doing business, repeated extensions of the term of copyright – which present a clear and present danger to the mission of the Open University to promote ‘educational opportunity and social justice by providing high-quality university education to all who wish to realise their ambitions and fulfil their potential.' Through his campaigning, his writings, his multitude of accessible and entertaining talks, all freely available on the Internet, Cory Doctorow has told this complex story, in a way we can all understand, of the largely successful lobbying of IP industries as they struggle to protect and extend their knowledge-based monopolies in the face of developments in technology. His boundless energy and advocacy of innovative business models and the removal of barriers to achievement does a service, not just to the OU and the general public, but the entertainment industries themselves which, even as they succeed in getting more and more draconian copyright laws and locked-down technologies, continue to experience a shrinking turnover of their products. In addition to this wide-ranging contribution in areas of special educational concern to the OU, Doctorow has made his specific unique contributions to OU courses like TU100 (My Digital Life). Doctorow was named one of Forbes magazine's 2007/8 Web Celebrities, and one of the World Economic Forum's Young Global Leaders for 2007. Doctorow co-founded the open source peer-to-peer software company OpenCola, sold to OpenText, Inc in 2003. He serves on the boards and advisory boards of a variety of cultural and charitable foundations and civil rights organisations such as the Participatory Culture Foundation, the MetaBrainz Foundation, Technorati, Inc, the Organization for Transformative Works, Areae, the Annenberg Center for the Study of Online Communities, and Onion Networks, Inc. 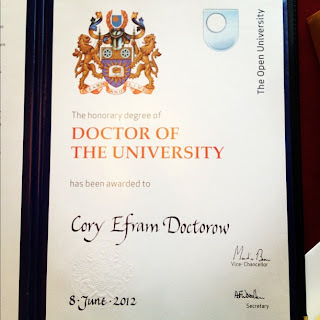 In summary, we nominate Cory Doctorow for an honorary Open University DUni, in recognition of his tireless endeavours and recognised international standing in areas of special educational concern to the University – technology law, policy and standards and the free flow of ideas – and our mission to ‘promote educational opportunity and social justice by providing high-quality university education to all who wish to realise their ambitions and fulfil their potential.’"